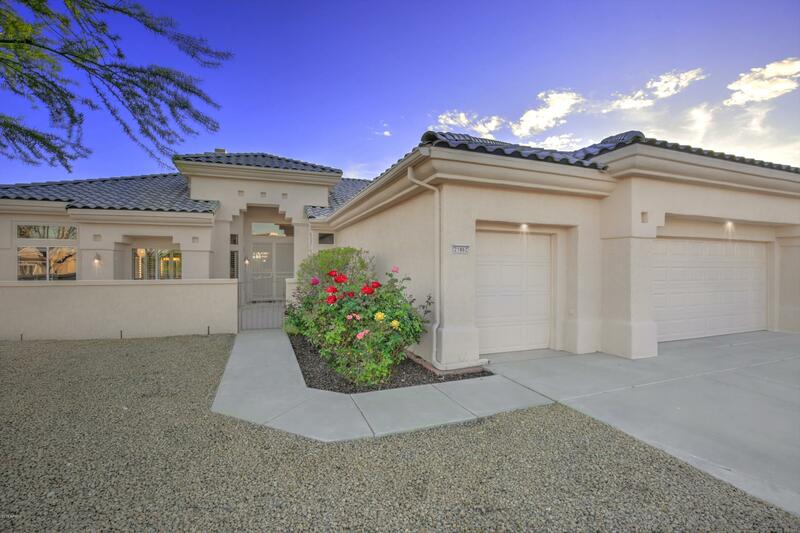 Beautiful Del Webb 'Estatel' SOMERTON, on oversized privacy fenced lot. Show appealling 2BDRM, 2.5BAs + large OFFICE+ 3cg. Gated tiled COURTYARD Entry. Covered & extended PATIO W BLT-IN BBQ. Rose garden beds and 'ready for planting flower beds. HIGH CEILINGS t/o. FORMAL DINING & LIVING RMS. Spacious Grt Rm FAMILY ROOM w/gas raised hearthFIREPLACE w enertainment niches connects openly to CASUALLY LOVELY DINING in 'KITCHEN' w/ISLAND. Black side by side w/ice maker REFRIGERATOR conveys.,Granite countertops, and Ruilt in Oven and Microwave. Recessed lighting . Plantation shutters t/o. MSTR BDRM STE & GUEST BEDROOM STE. MSTR BDRM w split dual vanities & WALK-IN & Walled Closets w closet blt-ins. A special 'beauty queen' well-loved SCW Home awaits you!